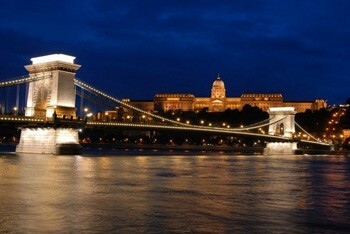 is featured among the most popular attractions in Budapest in all guidebooks. The district together with the Danube Bridges and the embankment is a World heritage site due to its importance played in Budapest’s history and development. intimate cafes and some great restaurants. One of the city’s best panoramic views can be admired from Fishermen’s Bastion. Although the district’s history dates back to medieval times, most of the buildings are from later era (17-19. centuries). Festival of Folk Arts– a 4-day festival around 20th August, the Budapest Wine and Champagne Festival – first half of September on the terraces of the Royla palace. TIP: If you do not like crowd then avoid these events, and time your visit in the low season: early or mid-spring, or mid-autumn. Admission to the Castle District itself is free, but there’s entrance fee to the major monuments and the museums in the Palace. Complete your sightseeing in Buda Castle with wine tasting in a romantic stone cellar within the Hilton Hotel. 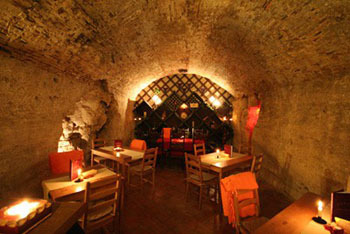 The vaulted cellar is part of the underground labyrinth system built by the castle inhabitants during the middle ages. Read more details about the Buda Castle District. 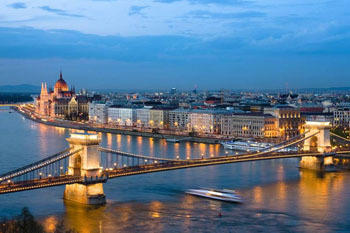 TIP: See the Top Sights of the Hungarian Capital Protected by the UNESCO’s World Heritage Program. 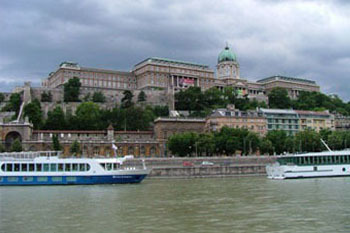 A boat excursion is a convenient and relaxing way of exploring the landmarks on the Danube banks. For a trully romantic experience choose the Cruise with Dinner & Live Music starting every day at 19.00.
the illuminated night cityscape of Budapest. Read also our account of an evening cruise on the Danube. The beautiful historical building complex at the southern foot of Castle Hill had been completely renewed by August 2014. 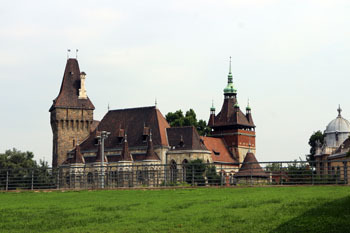 One of the most stunning works of the prolific 19-century architect Miklós Ybl was in a run-down state in last decades. 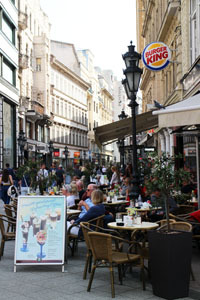 shops and a cafe make the sight one of the new landmarks of Budapest. Another well-known Budapest attraction is the Chain Bridge (Széchenyi Lánchíd) spanning the Danube at the foot of Castle Hill. Built in the middle of the 19th century, the stone bridge with the lion bridgeheads was the first permanent connection between Buda and Pest. A walk along the promenade, or known by locals as Duna Korzó offers wonderful views of the Danube and the Buda side with the Gellért and Castle Hills. Tram 2 runs along the promenade should you wish to see a longer stretch of the river bank. 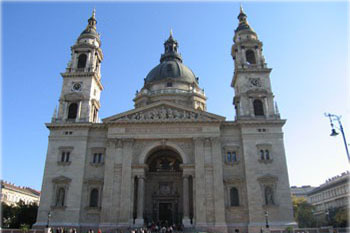 Read more about Budapest’s World heritage Sites. TIP: to be close to the most popular attractions, stay in a city centre hotel. 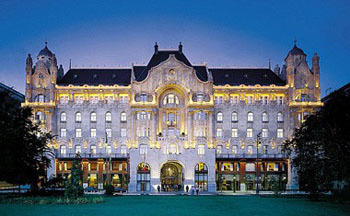 Central Budapest Hotels offer good-value accommodation in 3-star, 4-star and 5-star hotels. the art-nouveau Gresham Palace on Széchenyi Square at the Pest end of the Chain Bridge. 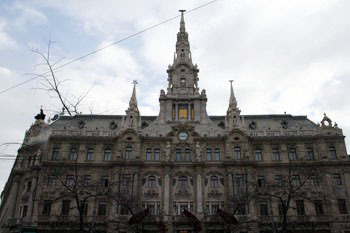 After an extensive restoration finished in 2004, the palace houses the Four Seasons Hotel Gresham Palace, one of the best hotels in Budapest. The building is especially magnificent illuminated by night. The dolomite cliff in Buda is one of the loveliest green spots in Budapest. 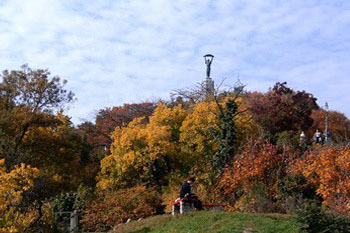 Gellért hill is one of our favourite places for weekend outings. Winding walkways lead up to the top where the Citadella, a former fortress and the Liberty Statue stand. The hill is dotted with groves and flowery parks; an excellent place for Sunday afternoon walks for the family. A nice rendezvous spot for couples too. Find out more about Gellért Hill. The church is the largest monument after the Hungarian parliament building, dominating the Pest side of the Danube. The Basilica regularly hosts classical concerts including a fantastic organ performance. Inside you can see one of Hungary’s most treasured relics, the Holy Right hand of King St. Stephen. The spacious plaza in front of the cathedral is flanked by cafes and restaurants. Read details about the history and architecture of St Stephen’s basilica. 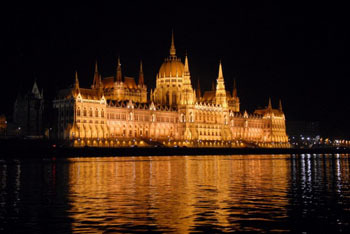 The 3rd largest in the world and the 2nd largest in Europe, the Parliament Building is home to Hungary’s greatest treasure the Holy Crown of St Stephen. The impressive neo-Renaissance building with its 96 m high dome dominates the Pest bank of the Danube standing between the Chain Bridge and Margaret Bridge on Kossuth Square. Tram 2 and the M2 metro (red line) have a stop here. You can easily get to the Parliament by walk when you’re wandering around the city centre. Best to explore on a guided tour: we offer a 1-hour guided tour of the building followed by an early afternoon cruise on the Danube. Cafe TIP: Szamos Cafe on Kossuth tér, on the side of the square offers a wide range of sandwiches, gourmet pastries, cakes, coffee, hot chocolate and light lunch. There’s also a small Chocolate Museum & Shop on the 1st floor. Great view of the Parlaiment from the terrace. 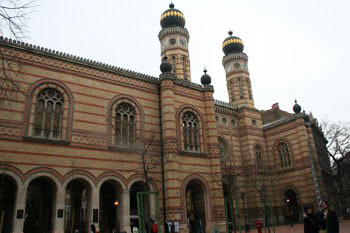 The Great Synagogue in Dohány Street, in district VII. is one of the world’s largest and most beautiful synagogues. Even if you aren’t religious you must see this magnificent Jewish monument. Budapest once had a large Jewish community, the monuments of which are scattered in the former Jewish Quarter. You can explore the Central Synagouge, and other Jewish sights on a guided tour. 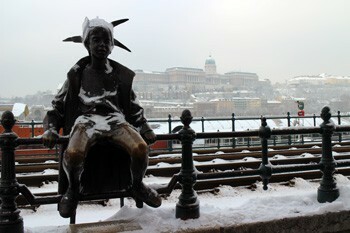 One of my absolute favorite attractions in Budapest is Andrássy út. The elegant avenue similar to Parisian boulevards, connects the inner city with Heroes’ Square and City Park. It is lined with cafes and restaurants where you can while away by a cup of coffee and cake. The Lotz Room in the Alexandra Book Cafe is worth a visit for its old world coffee house atmosphere, amazing decor and fine cakes. You can also while away in the spacious two-storey bookstore that has a nice selection of foreign language books and magazines. 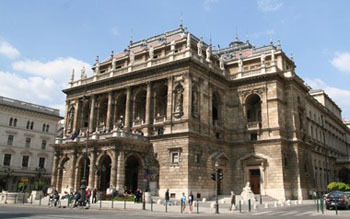 The Hungarian State Opera House an artfuly decorated building which you can explore on guided tours is also here. Besides the Opera House, the avenue is a treasure trove of fine architecture so it’s well worth a long walk. For a quick lunch or coffee, try Callas next to the Opera House. Their cakes are scrumptious, and they also serve splendid cocktails that you can enjoy on the terrace. 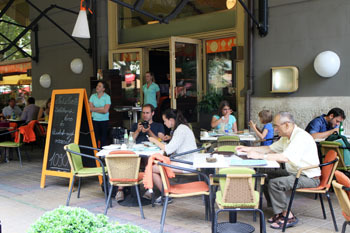 If you plan a longer walk, you can take a rest in one of the many sidewalk cafes and restaurants lining the road. 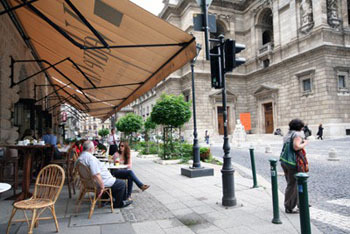 Liszt Ferenc tér and Nagymező utca, two side streets opening from Andrássy út, offer a wide choice of cafes and restaurants with outdoor terrace. Try Két Szerecsen Cafe & Restaurant (Nagymező utca 14.) for a fine cappuccino and tasty breakfast. The ice cream in Fragola (Nagymező utca 7.) is a must on a sultry summer day. 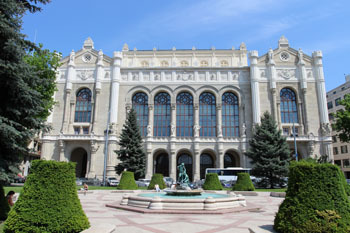 Find information on Budapest Museums. 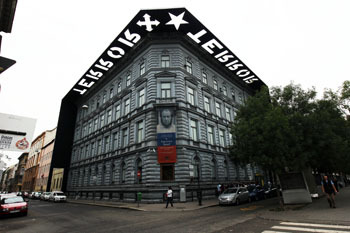 The House of Terror Museum at Andrássy út 60. The House of Terror Museum is also located on Andrássy út should you want to find out about the terrible Nazi and Communist Era. The exhibitions shed light on the violent things the Nazis, and later the organizations of the Communist party committed during those years (WW II and after). 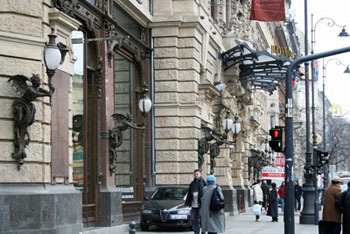 Read more about sights and attractions along Andrássy Avenue. Although Váci utca tends to be crowded during the tourist season, it is one of the best known attractions in Budapest. On a walk in low season (early spring or mid-autumn) you’ll be able to discover some nice, historic buildings, and monuments. restaurants and cafes (mostly overpriced and geared towrrds tourists). 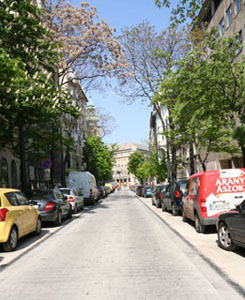 Find out more about Váci utca and its attractions. TIP: Váci utca ends in Vörösmarty Square where the main Christmas Fair of Budapest is held each year, from mid November till end of December. 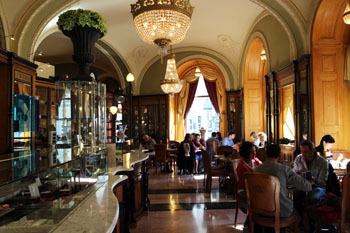 It is also home to the iconic Coffee House & Cake Shop, Gerbeaud. 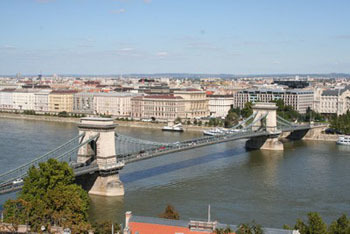 Budapest’s city centre, the inner city or downtown is district V., is the area bordered by the Danube between the Chain Bridge and Elizabeth bridge and the Small Boulevard (Kiskörút). We Hungarians call this part Belváros (=inner city). It is where once the heart of historic Pest was. The remains of the former city wall can be spotted at some places (e.g. in Kecskeméti utca). Most luxury hotels are also located here, especially on the Danube bank (Four Seaons Gresham Palace, Marriott, Intercontinental, Sofitel). The renovated Vigadó Hall on the riverbank in Pest is home to concerts and exhibitions. You can view and learn about the history of the 19.-century building, originally called Redoute on guided tours (tickets can be bought in the Vigadó’s ticket office). The New Main Street of Budapest is a a major development project of the Inner City (district V.) the 1st phase of which was finished in spring 2010. 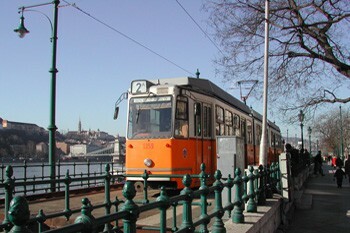 The Új Fő utca runs between Kálvin tér and Szabadság tér, parallel with the Danube. Much of the traffic is directed away to create a cleaner, fresher, more pedestrian-friendly area in the city centre. A unique, interactive water fall at the southern end of Szabadság Square is the highlight of the project. adding a cool contemporary look. Cafes, restaurants are plenty in the neighbourhood, should you get peckish during exploring this new part of the Belváros. For me the Central Market Hall is like a large treasure trove of fresh vegetables, fruits, meat, fish and culinary delicacies. 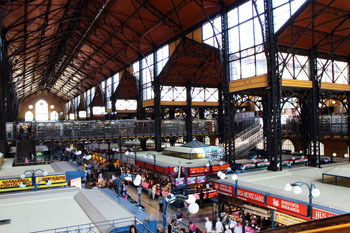 The spacious market at the Pest end of Liberty Bridge (Szabadság híd) however is famous for its architecture too. Built at the turn of the 19-20. centuries it was one of the most modern indoor markets not only in Budapest but in the whole world. For fish and game take the escalator to the basement level. 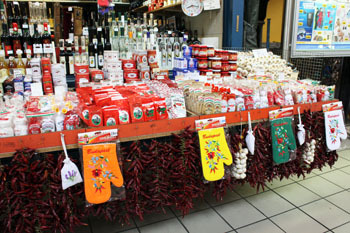 The Great Market hall is an ideal place for buying Hungarian souvenirs (paprika powder, wine, fois gras, salamis and sausages). For Hungarian folk textiles and embroidery go to the first level. 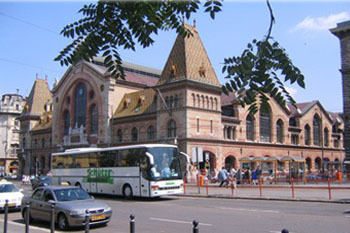 The first level also has some restaurants and buffets offering traditional Hungarian fare. TIP: since the two attractions are close to each other, you can connect visiting the Central Market with a walk in Váci Street. See other food markets in Budapest. 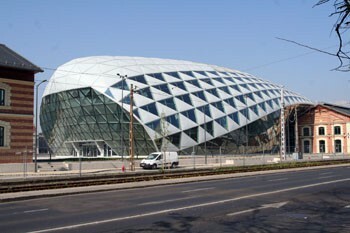 The Budapest Whale Cultural and Shopping Centre opened in November 2013. Apart from shops, restaurants and cafes, it will host cultural programs and exhibitions. The unusual looking building on the Pest bank of the Danube is in the place of four 19th century public store houses (some of the original architectural elements were kept intact). The New Budapest Gallery on the second floor is a place for modern art exhibits created by local artists. If you are strolling along Nagykörút (Grand Boulevard), the grand building of the New York Palace on Erzsébet körút will catch your eye. Once a headquarter of the New York Insurance company, the lavish building was converted into a 5-star luxury hotel by the Italian Boscolo Group between 2001-2007. Read a detailed review of the New York Palace Boscolo Hotel. The ground-floor of the palace housed the famous literary coffee house, the New York Cafe which is considered to have been one of the most attractive cafes of the world at that time (turn of the 19th-20th centuries). The New York Coffee House was also restored to its original glory during the hotel construction. 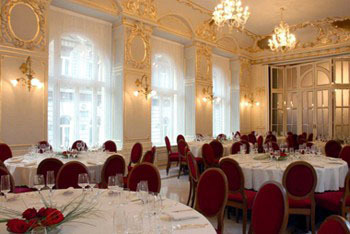 but it’s a stylish place reflecting the grandeur of the Austro-Hungarian Monarchy. Prices are matched to this grandeur too, but a cup of tea or coffee is worth the price to see the amazing architecture and decor as well as to experience the grand coffee house atmosphere Budapest was famous for in the first third of the 20th century. 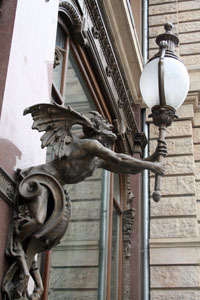 My favorite parts of the New York Palace are the demonic bronze lamp holders outside the building. 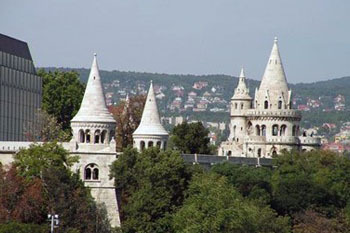 Besides Gellért Hill, Margaret Island (Margitsziget) is another of our family excursion spots in Budapest. 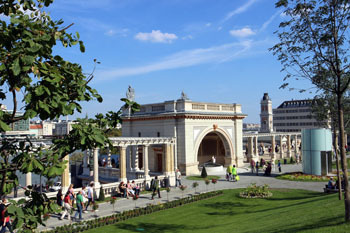 Situated at Margaret Bridge, the island on the river Danube attracts nature lovers with its flowery parks. 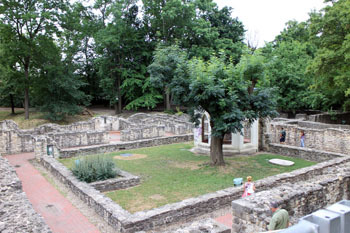 Numerous ruins tell about the history of the island. Jogging tracks run along the line of the Danube, and bikers, skateboarders also have lots of space to practice their favorite sport. Read more about Margaret Island (Margitsziget). 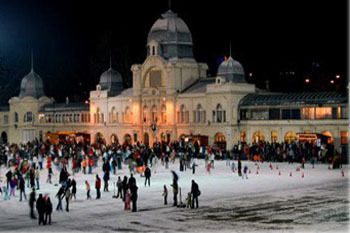 Part of the lake functions as an ice skating rink in the winter months. 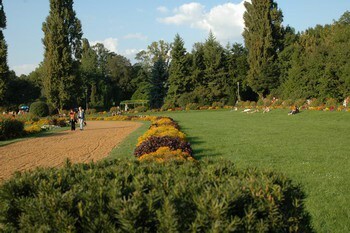 The park has some fine restaurants like the famous Gundel, or the Bagolyvár Restaurant. 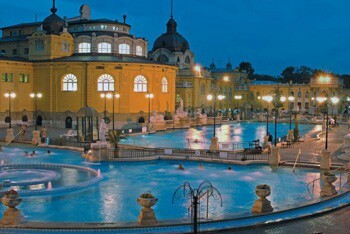 And last but not least, in a list about top Budapest Attractions the world-famous thermal baths must be included. The capital city, and the whole of Hungary, abound in thermal springs with healing qualities upon which numerous spas and thermal baths have been built. the turn-of-the-19th-20th-centuries baths like the Gellért, and the Széchenyi Baths. Apart from these, there are several spa and wellness hotels in Budapest too, providing upscale accommodation with modern and traditional massage therapies and other wellness services. Most baths have outdoor pools to enjoy in the hot summer months. 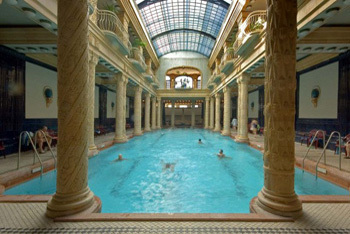 You can read more about Budapest baths with outdoor pools here. TIP: Some of the spas (the Széchenyi in summer, the Lukács in autumn) host parties, should you want to try some unique way of night enetertainment: dancing on music provided by star DJs, laser effects, splashing, and drinking. TIP: Take your time to visit some of the hidden attractions, secret places that mostly locals know about: lesser-known historic sights, off-the-beaten-path neighbourhoods, tucked-away parks, interesting shops.